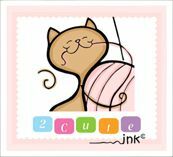 2 Cute Ink Digital Stamps and More! So last night I was able to ink that cute little bear and frog sketch. I think it turned out super cute! One of my goals is to try to ink sketches right away so they don't end up in sketchbook land lol. This little cutie "Birthday Friends digital stamp" is now available in my 2 Cute Ink Etsy Shop. I am very excited to start sketching again! Today is my mom's birthday so I thought why not draw her something. My mom LOVES bears and frogs so I thought of a cute bear holding a frog that is wearing a party hat. I have been wanting to do something with my sketches so I am playing around with the idea of offering prints?, tote bags?, journals, t-shirts? and maybe i phone cases. I just think it would be so fun to see my sketches as products. Don't worry I am going to be turning my sketches into digital stamps to! To the 2 Cute Ink Blog! Where I share my digi's, doodles, crafts and more! I hope to inspire you with my cute art!